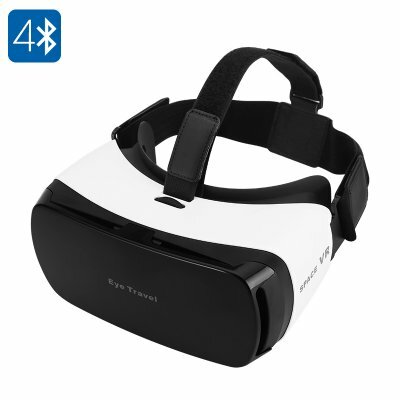 Successfully Added Virtual Reality 3D Glasses - For 3.5 To 5.5 Inch Smartphones, 110 FOV, Bluetooth, Head Band to your Shopping Cart. Enter the astonishing world of 3D and virtual reality through the power of your phone with these incredible VR Glasses. Compatible with smartphones ranging from 3.5 to 5.5 inch in size these virtual reality glasses are suitable for most smartphones on the market. Wait no longer and experience entire new gaming worlds or watch all your favorite movies and stunning 3D quality – these stylish 3D glasses are here to meet all your entertainment needs. With its stylish looking white plastic frame, comfortable eye patches, and velcro head band these 3D glasses are comfortable to wear and are ought to fit every person no matter the size or shape of their head. Whether you are in the comfort of your own living room or on your way to reach your next holiday destination, simply slide on the glasses and slip in your Smartphone to enjoy a true cinematic experience at any time and where ever you are. Next time you browse through the App store why not check out some of the Apps and games suitable for use with VR headsets such as the Google cardboard. With these amazing virtual reality glasses an entire new entertainment world opens up filled with VR entertainment and 3D games. Alternatively, why not search for 3D side by side video’s on the Google Play Store to enjoy a full 3D cinematic experience in mesmerizing quality that only VR glasses could possibly provide. Get ready for an entirely new entertainment experience like never seen before. Ready to be used right out of the box these VR glasses allow you to have your own mini-theater at home without the need to buy or install any expensive equipment. Have all the 3D fun you can and engage in exciting adventures in virtual words with these staggering mini virtual reality glasses. These VR Glasses come with a 12 months warranty, brought to you by the leader in electronic devices as well as wholesale Virtual Reality glasses..
Arabic: - نظارات 3D VR - Chinese Simplified: - 3D 虚拟现实眼镜 - Czech: - 3D virtuální brýle - Danish: - 3D VR briller - Dutch: - 3D VR bril - French: - Lunettes 3D VR - German: - 3D VR-Brille - Hebrew: - משקפיים 3D VR - Hindi: - 3D VR चश्मा - Italian: - Occhiali 3D VR - Japanese: - 3D VR メガネ - Korean: - 3D VR 안경 - Malay: - Cermin mata 3D VR - Norwegian: - 3D VR briller - Romanian: - Ochelari 3D VR - Russian: - Очки 3D VR - Spanish: - VR 3D gafas - Thai: - แว่นตา 3D VR - Turkish: - 3D VR gözlük - Vietnamese: - 3D VR kính.